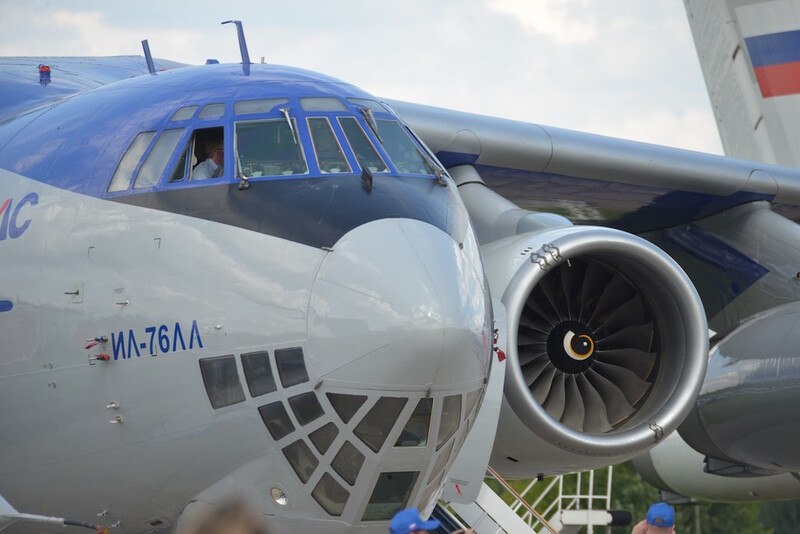 The PD-14 turbofan began flight trials aboard an Il-76 test bed in 2015. Russian civil aviation authority Rosaviatsiya has issued type certification for an indigenous engine alternative for the Irkut MC-21 narrowbody known as the PD-14, the country’s Ministry for Industry and Trade announced Thursday. A pair of MC-21 prototypes powered by Pratt & Whitney PW1431G geared turbofans now engage in flight testing, but PD-14 certification marks an important advance for the Kremlin-ordered Import Substitution program, aimed at achieving Russian independence in the commercial aviation domain. Compared with previous-generation Russian commercial turbofans, the PD-14 offers a fuel burn decrease at typical cruise of 15 percent, while featuring a bypass ratio of 8.5:1 as opposed to more commonly achieved ratios of 5:1 or 6:1. Its specifications call for fuel consumption comparable to that of the Pratt & Whitney PW1000G series and CFM International’s Leap family. Given that, the PD-14 claims its place as the world’s third engine purposely designed and certified for use on next-generation narrowbody jets. Preliminary studies into a next-generation turbofan began in Russia at the turn of the century. In 2008 Vladimir Putin made the decision to provide state funding for the project. Bench testing began in 2012 and flight trials in 2015 on an Il-76 testbed. Developed under the framework of the federal program dubbed “Development of Russian Aviation Industry 2025,” the PD-14 program started with a budget of 80 billion roubles ($1.22 billion) covering development and production setup. Perm-based ODK-Aviadvigatel leads the development effort while ODK-Perm Motors performs final assembly line in the city of Perm. The PD-14 marks the first commercial engine project executed under the umbrella of the United Engine Corporation (Russian acronym ODK), a government-controlled organization formed by the merger of Russian companies involved in powerplants, gearboxes, and other subsystems for applications in commercial and military aviation. As a result, the government distributed work packages to ODK members to cut development and production preparation cycles. In terms of technology as well, the PD-14 represents a drastic departure from the previous generation PS-90A. Using hollow wide-chord blades for the fan and blisks in the compressor, the newer engine weighs about three tons and develops 14 tons of thrust at takeoff. Engineers designed the baseline engine specifically for the 180-seat MC-21-300, but its derivatives can power both larger and smaller airplanes. The developer announced three versions of the PD-14—the PD-14A, PD-14, and PD-14M--featuring the same 1900 millimeter fan diameter. Intended for the 150-seat MC-21-200 “shrink” variant, the PD-14A produces 11 percent less thrust and resembles the baseline model but with a compressor pressure ratio of 38:1 rather than 41:1 for higher thermal margins. The PD-14M for the Il-96-400M and MC-21-400 develops 12 percent more maximum thrust. It features an additional stage in the compressor, resulting in an increase in pressure ratio to 46:1 and a drop in bypass ratio from 8.5:1 to 7.2:1. The developer also plans a higher-thrust derivative, known as the PD-18, incorporating a geared fan for maximum thrust of 18- to 20 tons; smaller versions designated PD-7 and PD-10 feature a reduced fan diameter for various Sukhoi Superjet variants. Meanwhile, plans call for use of the PD-14’s core in the PD-12 turboshaft, and for a larger PD-35 intended to power the Sino-Russian CR929 widebody.